Cut to a relaxed silhouette, this top from Vero Moda is perfect for a casual day out. Made from good quality fabric, this will be perfect according to your convenience. 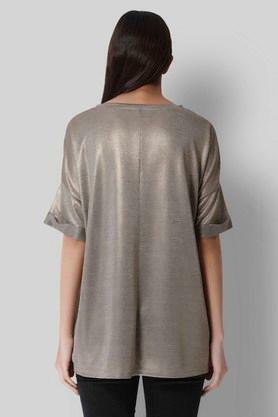 Featuring a round neck, half sleeves and shimmer pattern, this top possesses a stunning urbanity. If elegance is your style, then this top is a perfect pick for you. Style this with a pair of denims and pumps for a sophisticated allure.